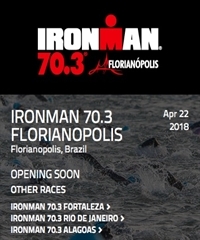 70.3 Florianópolis will lead athletes along 1.2-mile (1.9 km) swim, 56-mile (90 km) bike and 13.1-mile (21.1 km) run throughout the city that has lived the IRONMAN spirit for almost two decades, hosting IRONMAN Brazil. The race will begin in the Ingleses Beach with a one-lap swim. After the swim, the one-loop bike course will take participants through a scenic an extremely fast course. Athletes will conclude the race with a three-loop run along sparkling beaches in one of the most beautiful cities in Brazil.